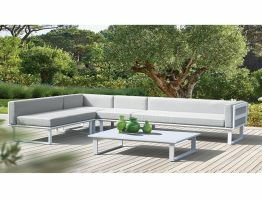 Outdoor Sofa Matt White Aluminium with Cushion by Bent Design Studio perfect for an outdoor area. The sparse framework is made from light weight aluminium metal, which is treated to increase its resistance to weather and sun damage. 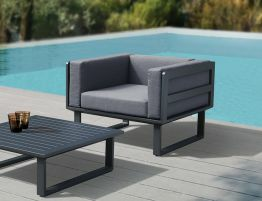 Combining the highest levels of comfort, quality and style, Vivara Collection creates luxury outdoor furniture that enables our customers to enjoy outdoor living without compromises. All materials are carefully selected and finished to ensure products of unsurpassed resistance to extreme conditions. The result is luxurious furniture that endures. 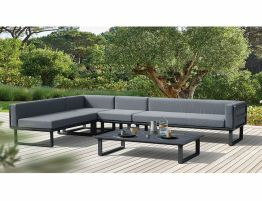 The pleasure of sitting is given by the soft light grey colour cushions are made in textilene a woven, open-mesh fabric made from a vinyl coated, high strength polyester yarn. 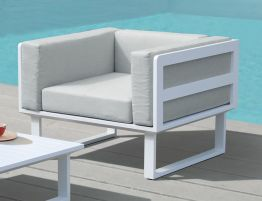 The aluminum frame and seat are both easy to maintain, weather-resistant and recyclable.